We need you! 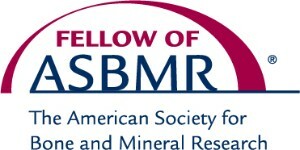 ASBMR volunteer leaders play an active role in developing and leading the worldwide research agenda in bone, mineral and musculoskeletal science. Nominate yourself or a colleague for a leadership position to actively contribute to ASBMR’s strategic goals, develop crucial leadership skills and make important career connections. The deadline for applications is March 11, 2019. Click here for more information and to submit a nomination! 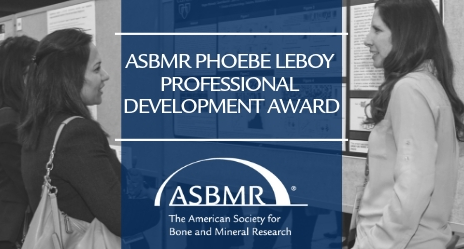 With a new application process for 2019, the Phoebe Leboy Professional Development Award is for a female young investigator who resides outside the United States (preference given to those in an emerging and/or developing country). The award will provide the resources needed for the selected individual to attend the 2019 ASBMR Annual Meeting, mentorship from senior women in related areas of research, and membership in ASBMR. The award amount is up to $2,000. To read more about the award and eligibility requirements, click here. Applicants must submit a draft of the abstract they plan to present at the 2019 ASBMR Annual Meeting, one letter of support, a current CV, and a summary of their career objectives. Applications will open Monday, January 14 with an application deadline of February 22, 2019. Last Call: Apply for the USBJI Young Investigator Initiative Grant Mentoring and Career Development Program Today! Deadline is Next Tuesday, January 15, 2019. The USBJI Young Investigator Initiative is a grant mentoring program providing early-career investigators an opportunity to work with experienced researchers in our field to assist them in securing funding and other survival skills required for pursuing an academic career. The unique aspect of this program is the opportunity for attendees to maintain a relationship with a mentor until their application is funded. The Spring 2019 workshop will take place on April 26-28, 2019, in Rosemont, Illinois, USA (Chicago). Click here to learn more about the program, eligibility requirements, and application instructions. The deadline for applications is next Tuesday, January 15, 2019. Now Accepting Late-Breaking Abstracts for the IFMRS Herbert Fleisch Workshop! Deadline to Submit is January 15, 2019! The International Federation for Musculoskeletal Research Societies (IFMRS) is now accepting late-breaking abstracts for the 3rd Herbert Fleisch Workshop, held March 17-19, 2019, in Brugge, Belgium. The Herbert Fleisch Workshop is designed to bring together excellent international investigators and young and mid-career scientists working in bone and cartilage research, for vigorous data discussion and networking. Students, postdocs, and early stage PIs are therefore particularly encouraged to submit an abstract. All aspects of bone biology, basic and applied, are welcomed. For more information and to access the abstract submission form, click here. The deadline to submit late-breaking abstracts is Tuesday, January 15, 2019. In 2018, the National Academies of Science, Engineering, and Medicine (NASEM) published five reports on a broad range of issues in scientific education, research, and training. The Association of American Medical Colleges, FASEB, and NASEM are launching a monthly, one-hour series of webinars to discuss the major findings, implications, and recommendations from these reports. On the third Monday of the month from 1:00-2:00 p.m., each subsequent webinar will feature a NASEM study director and focus on a single report. The next of these webinars will be held on Monday, January 14th, and will be covering the NASEM report “Open Science by Design: Realizing a Vision for 21st Century Research”, hosted by Tom Arrison, program director in the Policy and Global Affairs Division of NASEM. Click here to learn more and register. Nominations for 2019 Fellows of the ASBMR Are Open! Been a Full Member of ASBMR for at least ten years (does not have to be continuous). Demonstrated significant contributions to the field. This distinguished program recognizes long-term ASBMR members who have made outstanding contributions to the field of bone, mineral and musculoskeletal science. The program is committed to recognizing the breadth and diversity of the Society’s membership. Fellows are nominated by their peers, followed by evaluation and selection by a review committee. To learn more about this exciting new program, the eligibility criteria and nomination guidelines click here. The nomination deadline is March 15, 2019. FASEB Excellence in Science 2020 Award Nominations Now Open! Award recipients will be expected to present an Excellence in Science Award Lecture at the annual meeting of a FASEB Member Society. Presentation of the award will take place in conjunction with the lecture. In addition to the unrestricted research grant, the award covers the recipients’ travel to/from the meeting, hotel expenses, complimentary meeting registration, and a plaque in recognition of the awardee’s achievement. The deadline is March 1, 2019 at 11:59 pm ET. Click here for more information. U13 Bench-to-Bedside Conference: "Osteoporosis and Soft Tissue Disorders"